If your heart was full of love, could you give it up? Would you run? Would you fight? Would you fall, to fate? 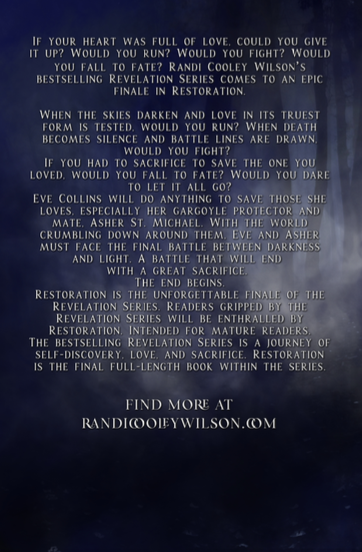 Randi Cooley Wilson’s bestselling Revelation Series comes to an epic finale in Restoration. When the skies darken and love in its truest form is tested, would you run? When death becomes silence and battle lines are drawn, would you fight? If you had to sacrifice, to save the one you loved, would you fall to fate? Would you dare to let it all go? Eve Collins will do anything to save those she loves, especially her gargoyle protector and mate, Asher St. Michael. With the world crumbling down around them, Eve and Asher must face the final battle between darkness and light. A battle that will end with a great sacrifice. The end, begins. Restoration is the unforgettable finale of The Revelation Series. A journey of self-discovery, love, and sacrifice. Readers gripped by The Revelation Series will be enthralled by Restoration. Intended for mature readers. The bestselling Revelation Series is a journey of self-discovery, love, and sacrifice. 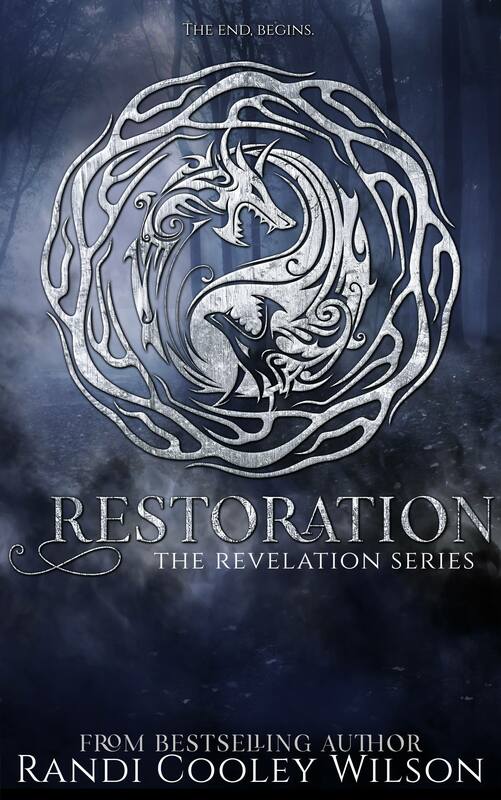 Restoration is the final full-length book within the series, which is meant to be read in release order. Exceedingly well-written, with enough character interaction to keep anyone happy; twists, turns and intrigue; betrayal; heartbreak; trust me when I say it's all here. Absolutely fantastic and I really can't recommend it highly enough! Sheer perfection!!! This series is NOT TO BE missed. Consistent flawless storytelling throughout the series. The author crafts a complete, satisfying conclusion to this epic saga. I devoured this series in less than a week. I mean, seriously, why can’t there be like 20 books in this series? The action in Restoration was jam packed. There were also several scenes that blew me away! I can’t express to you how much you need to go read this book. Go buy the whole series, right now!!! Randi has delivered a series with unexpected twists, gasp-out-loud cliffhangers, tearful and heart-wrenching scenes, loveable characters and a story so well put together with an outstanding ending. This series has been amazing from beginning to end. I highly recommend everyone read it. [The Revelation Series] was one well thought out plotted story from the first book to this the last one, and it has been one wild ride and I have loved every second of it, and I hope you will too.